The Amen, the faithful and true witness, the source of God's creation says this: "I know that you are neither cold nor hot. I wish you were either cold or hot. So, because you are lukewarm, neither hot or cold, I will spit you out of my mouth. for you say, 'I am rich and affluent and have no need of anything,' and yet do not realize that you are wretched, pitiable, poor, blind, and naked. "Whoever has ears ought to hear what the Spirit says to the churches." 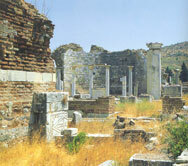 The church in Laodicea (3:14-22) was closely related to its sister church in Colossae and Hierapolis. Its spiritual condition was lukewarm-neither hot nor cold. Six miles north of the city were the thermal springs (not drinkable) at Hierapolis, whose white calcareous cliffs were visible in the distance. The exhortation to buy white garments to cover their shameful nakedness is another example of irony. For the believers were living in a city where the Romans had established textile factories to manufacture clothing from the famous black wool of the region. Laodicea was a "throne city" because a citizen Zeno became king of Cilicia in 39 B.C. and of Pontus in 36. His family continued to rule in some measure in Anatolia over the next century. The Zenoid family figures prominently on the Laodicea's coinage. Again the victors are promised that they will sit with Jesus on his heavenly throne.